The unique benefits of CBD/THC combined with all-natural nutrition to fuel your workout and support recovery. Made with 16g of Whey Protein, Organic Matcha Green Tea, Whole Flaxseed and all natural ingredients. Our protein packed Matcha Bar is rich with antioxidants, vitamins and minerals that in combination with CBD & THC and all natural ingredients, have been said to boost energy levels and increase metabolic rate, allowing your body to burn fat more efficiently. Made with 16g of Whey Protein, Organic Coconut, Cacao Beans, Whole Flaxseed and all natural ingredients. Dark Chocolate is a known antioxidant that helps reduce blood pressure and increase blood flow so muscles can keep working hard. Combined with simple, all natural ingredients, along with CBD & THC, this protein packed chocolate bar will leave your mouth watering for more. As your physical performance accelerates and you’re able to push yourself harder, you’ll also need to recover hard! Understanding that challenge – we’ve developed our Refined Performance bars to enhance your recovery and bring you back to to your peak performance. Amplify your performance, redefine your routine, with Refined Performance protein bars. Refined Performance CBD can regulate your body’s response to hard exercise, while THC can lessen your sensation of soreness, aiding your ability to relax and sleep, which is crucial for letting your body rebuild after a strenuous workout. 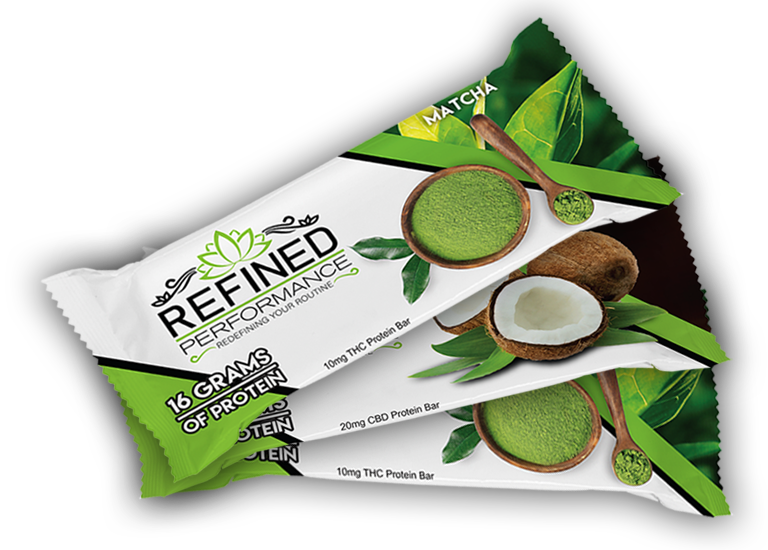 Refined Performance 20mg CBD bars are available for purchase at Harvest locations without needing a patient card.